Shrimp flies were first tied in the early nineteen thirties, the one which has become most popular in Ireland is Curry's Red Shrimp, by Pat Curry from Coleraine, Northern Ireland. There are almost as many variations of this pattern now as there are fly-tiers; no question, for the small or medium sized rivers of the North-West it is a very effective fly; countless salmon fall for it every season. 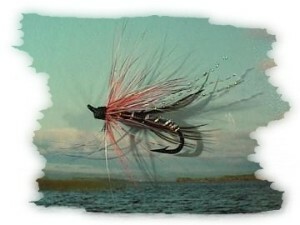 Like many salmon flies, the Shrimp Fly should be tied on doubles or trebles ( preferable trebles ) in sizes 8 to 14. Small flies in sizes 12 or 14, even 16 are used to catch salmon in low water conditions. When water levels- and speeds are higher, the small flies are hard to fish, they often don't go deep enough and come around too fast, can hardly be noticed by any fish. What these two well known anglers of the region, Ray and Dietrich, now observed was: when fishing bigger flies in higher water, nosey salmon came up to have a look at the Shrimp Flies, Silver Doctors, Soldier Palmers or whatever was used as attractor fly; but didn't take. They are coming short, was the common explanation. Ray developed a theory now: so, the anchors ( he called generally anything but singles by that name ) are only looked at, and always from the same distance, they never come closer than about eighteen inches. Therefore another, smaller fly has to be tied that distance behind the anchors. When they now come up to have a look at the anchor, the small fly dangles around their eyes, annoys them and they just grab it. Dietrich stared in slight amazement at his well known angler colleague Ray and successfully suppressed a hefty laugh. Following his theory, Ray began working on a cast: on the bob came a Shrimp Fly, tied on a size 10 double, eighteen inches behind that came a size 14 Bibio, after another four foot or so came a Soldier Palmer, size 8, single hook. Now every fish looking at the anchor, must have his snout right close to the Bibio, explained Ray as he prepared for the first cast with this combination; his colleague, the other well known angler of the region, Dietrich, stared again in amazement and could not suppress a laugh, or two this time. On this first Trial with the 18 inches method, inventive Ray caught three salmon, between 4 and 6 pounds, all on the small Bibio, though the water was actually, much to high for the small fly. The heavy Shrimp Fly obviously stabilised the Bibio, brought it to the right depth and attracted salmon. Dietrich lost his humour that day, since he couldn't catch a fish on his conventional cast - they all came short; you see.